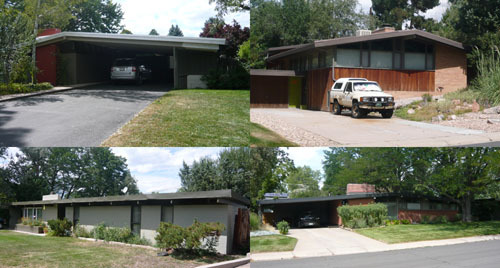 I have an abiding interest in the work of Charles Haertling, Boulder’s most well-known architect from the 1960’s and 70’s. 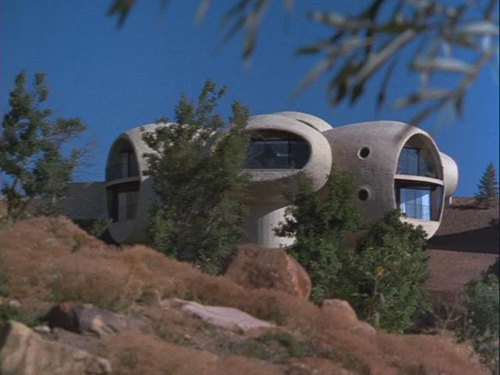 His organic designs have been extremely influential and are much more finely resolved than the better known works of other organic architects like Bruce Goff. 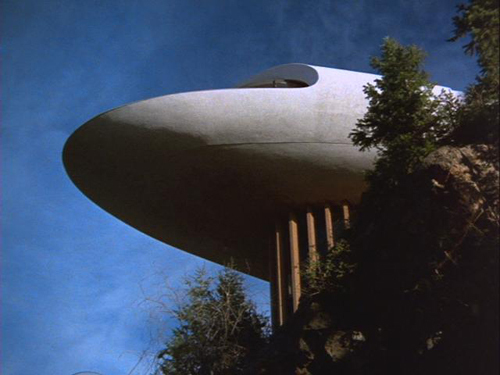 One of his most interesting buildings appears briefly in Woody Allen’s film Sleeper from 1973. It is really only an establishing shot and I am pretty sure none of the interiors from the film are of the actual house. 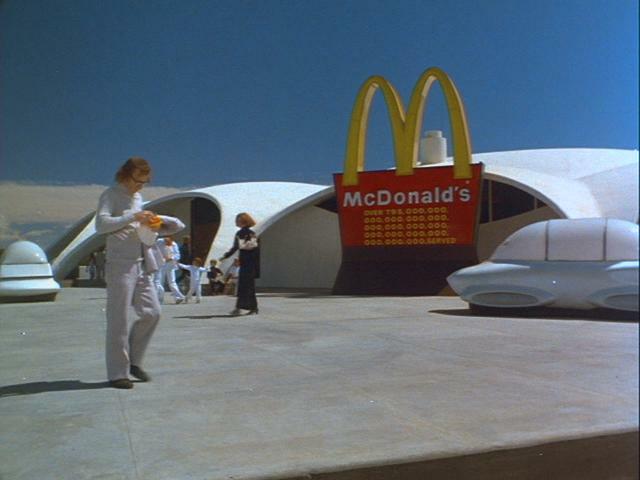 What may be of note here is that Allen’s future is a city-less one filled with modern, space-age buildings and for that he left his precious NYC to film in Colorado. 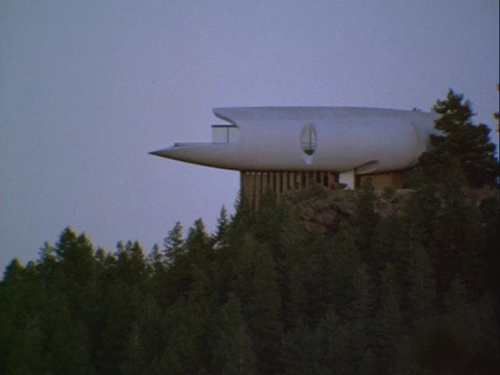 The houses depicted in the movie, the Sleeper house and the Brenton house, are displayed as modern and although a bit alienating, not entirely evil. 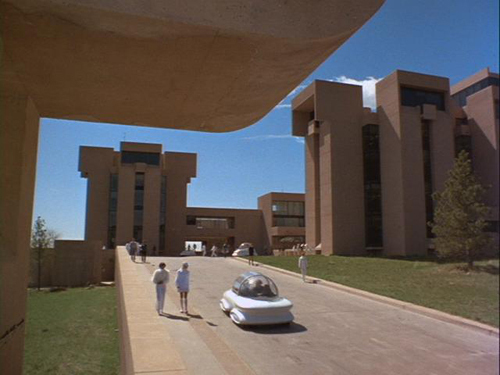 NCAR on the other hand is the embodiment of the tyrannical, hero-worship technological society. Maybe both of those portraits are appropriate for the programs of the buildings and maybe as well for the architectural background of I.M. 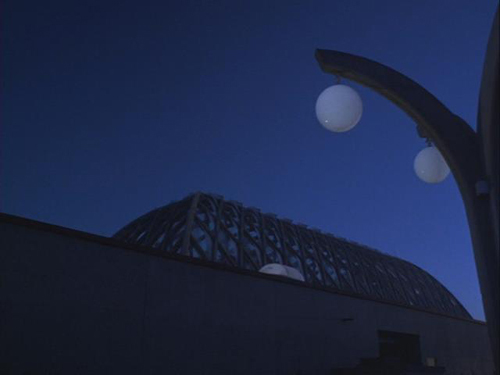 Pei, NCAR’s architect. Schooled in the heady days of unabashed hero-worship, the building has all the hallmarks of the Mies/Gropius/Rudolph scaleless, dehumanized placelessness. By contrast, the houses by Haertling and Deaton were self-conscious antipodes to harsh geometries and materials of late Modernism and attempted to incorporate new spatial concepts while still holding on to Modernism’s liberating ideologies. Does this difference represent a slightly different generation of architect, is it reflective of the radical shift in attitudes of the 1960’s, or is it a reflection of two architects born and educated west of the Mississippi (Deaton and Haertling) as opposed to the Modernist orthodoxy of the East Coast (Pei)? It is rare that really good mid-century modern architecture finds itself not confined to the design of an isolated building. 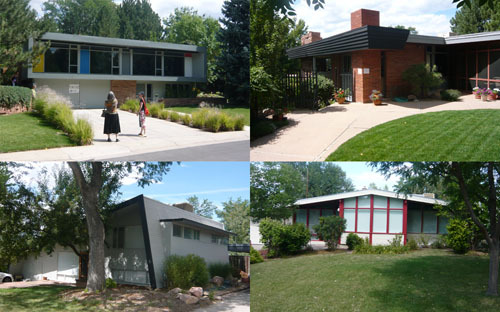 So much of the ethos of that period of Modernism was committed to making unique, site- and client-specific buildings, that it is unusual to see a cluster of homes that all reflect the design ambitions of Modernism. Arapahoe Acres in Englewood, Colorado is one of the shining exceptions. Arapahoe Acres is a small, planned residential development bounded by more conventional developments and houses in suburban Englewood, just south of Denver. There are 124 houses, ranging from 850 to 2,500 square feet and all with flat or slightly pitched roofs and clearly unmistakable Modernist intentions. These are not all unique designs for individual clients, but rather a series of types, with significant variations, laid out on a curvilinear street pattern with knot-like semi cul-de-sacs. Most of the homes were designed between 1949 and 1957 by the developer and self-taught architect Edward Hawkins. Arapahoe Acres recently held their annual home tour featuring the interior and exteriors of about 8 homes. What is most striking is that these relatively little houses were so thoughtfully planned and finished that few significant additions or harmful renovations have been executed. As the neighborhood is on the National Register as a Historic District, this would limit maybe the worst abuses, but I think the reason for the lack of alterations is more due to the open planning, careful spatial layering and utility that pervades these houses. So while many of them are quite small, the extensive use of natural materials, including some really nice masonry, and clear and simple expressive structural framing lends a quietude and richness that has argued well for many decades for retaining them as originally designed. If you have a chance, take a drive around the neighborhood and you will see how really interesting it is. 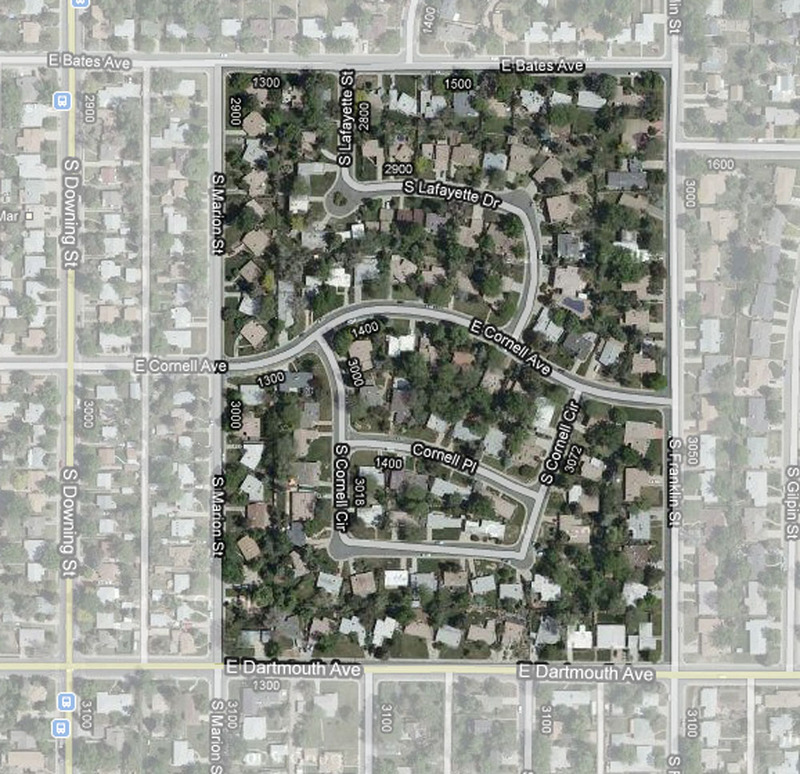 It is certainly suburban and houses all the difficulties that also plague most post-war car-centered developments. But the theme and variation, simple massing and consistent aesthetic makes for a very pleasing little oasis within the larger undifferentiated suburban sprawl of south Denver. And of course it is worth noting that this forward-looking development of well-designed and built homes, though now “historic”, is still light-years ahead of most current developments with cheesy fake-Victorian model homes, wood composite siding and faux stone chateaus. Arapahoe Acres embodies the positive, can-do attitude of post-war America where the future was eagerly anticipated and the best was yet to come. The historic Phipps Mansion in Denver is up for sale by DU and it looks like a buyer is under contract. If you don’t know the property, it is really worth a visit (it was open last weekend in Doors Open Denver). Designed by Jacques Benedict and built in 1933, it is neo-Georgian mansion, 22 rooms proud, surrounded by a kind of parterre garden. As noted in a previous post (https://mgerwing.wordpress.com/2010/03/22/phipps-mansion-for-sale/) the most interesting part of the property may by the magnificent Tennis Pavilion. 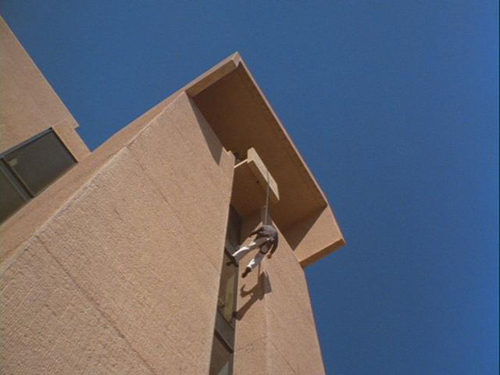 As mentioned in the earlier post, let’s hope that the new owners are good stewards of the property and don’t simply mothball the building in a kind of morbid stasis. Clearly occupation by a family would probably mean the renovation of at least the kitchen, if not a more significant part of the building. Living in a museum, of someone else’s life at that, would be very odd. Buildings shouldn’t be time capsules, unless you like living in the 1930s, including all the appropriate clothing, technology, etc. Like many great older buildings, the name of the original owners stays with the building. In historical terms it would be great if the new owners could add another layer of history and the building’s name incorporates their own as the legacy of ownership. DU has announced that it is planning on selling the Phipps Mansion in Denver. Located in Belcaro Park, the 6.5 acre property was the home of Senator Lawrence Phipps, built in 1933, and donated to the school in 1964. The house is a neo-colonial/Georgian brick mansion containing something like 22 rooms at 33,000 square feet. Most interesting is the Tennis Pavilion which besides the massive indoor tennis court below a 125-foot-tall glass ceiling, also contains a lounge, changing rooms and a tiny soda fountain. What I find interesting in this change of program for the building is the ongoing life of the house. Having gone from a very private residence to a public events center, what does the future hold for this property? Will it return again to a grand single-family house? Let’s hope that it doesn’t get sold and cut into pieces, becoming so many condos. I am currently working on two projects that have 100-year-old plus buildings as part of the overall existing buildings. But along with the original old house, there are additions that represent a owner’s need to alter the property with each passing generation. Bedrooms and kitchens get added on, interior walls are added or removed, the house changes and alters over time, a palimpsest of occupation. Frankly I am not so interested in the big house at Phipps as I am in the magnificent pavilion. However, if a building such as this has survived this well for almost a century, let’s hope its new caretakers can steward it on in a manner that does justice to its past and does not simply mothball the buildings in a kind of Ye -Olde-Sturbridge-Village stasis. Or better yet, let’s hope some architects, when asked to update or transform the given buildings, take care and add an architecture that is modern and yet sympathetic to the old house and speaks of the overall property’s continual growth and change. P.S. As a footnote to this post, a week or so later: It turns out that hundreds of people around the region have either been married on the grounds or had receptions there. How does the memory of these events move forward with new occupation? How is this space charged and lingers with so many happy memories, maybe a few regrets? Can you live in a house that seemingly “belongs” to so many other people? I recently passed by a project that was completed a number of years ago that was designed by myself, with Arcadea as the architect-of-record. This project started as a national AIA Young Architects competition in conjunction with Northeast Denver Housing Center and the convening of the AIA convention in Denver. My wife, Kate Iverson, and myself conceived of the winning submission of a series of small, market-rate condos and some ancillary retail space for this site in Five Points, in Denver. The character of the neighborhood has changed rather dramatically from the time of the initial competition to the final execution of the building five years later, to the current situation. Once a challenged, under-served neighborhood with the parallel problems of unemployment and crime, the place has now been significantly upgraded by the local light-rail service and some questionable gentrification. Some of the newer projects, like this one, were carried out by local non-profits on empty lots and greatly improved the neighborhood. Many simply displaced existing residents. Our solution to the problem of the site was to try to tie together the disparate scales of buildings on the adjacent streets and make a tough, but street-friendly building. I think it has been successful on the architectural level, but on the socio-economic one, I am not the one to judge or maybe even comment. So many things are beyond the reach of the architecture to positively effect. We should at least stick to the “first do no harm” motto.